"On 5 March 1944, 77 Independent Infantry Brigade, of which the 1st South Staffordshire Regiment formed a part, landed by glider at Broadway (Burma). On 12 March 1944, columns from the South Staffordshire Regiment and 3/6 Gurkha Rifles established a road and rail block across the Japanese lines of communication at Henu Block. The Japanese counter-attacked this position heavily in the early morning of 13 March 1944 and the South Staffordshire Regiment was ordered to attack a hill-top which formed the basis of the Japanese attack. 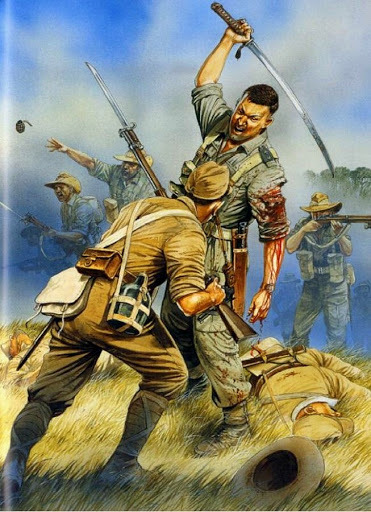 During this action, in which Lieutenant Cairns took a foremost part, he was attacked by a Japanese officer, who, with his sword, hacked off Lieutenant Cairns left arm. Lieutenant Cairns killed this Officer; picked up the sword and continued to lead his men in the attack and slashing left and right with the captured sword killed and wounded several Japanese before he himself fell to the ground. Lieutenant Cairns subsequently died from his wounds. His action so inspired all his comrades that, later the Japanese were completely routed, a very rare occurrence at that time." 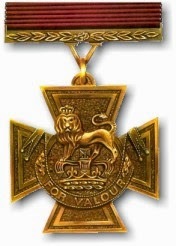 From Lt. Cairns' Victoria Cross citation, awarded on May 21, 1950.